You are probably familiar with the idea that eating probiotics, like the ones found in yogurt and other cultured foods, are good for you and help balance out the “bad” bacteria, especially in your digestive track. And you have probably heard about the risks of overusing antibiotic medicine and antibacterial soaps and cleaning products. But did you know that probiotics can be used to clean your home? Probiotics are microorganisms, usually bacteria, that are all around us… in a “biofilm” in our guts, on our skin, on surfaces in our home and are considered to be beneficial or healthy. For more on this, I loved the article by Michael Pollan, Some of My Best Friends are Germs, that was on the cover of the New York Times Magazine a few months ago. He talks about how we are really “superorganisms,” sharing our body with 100 trillion microbials and of the harm we have unwittingly done in the last decade by using antibiotics. I recently had the opportunity to try out a local San Diego company’s housecleaning services and to speak at length with one of the employees about probiotic cleaning. 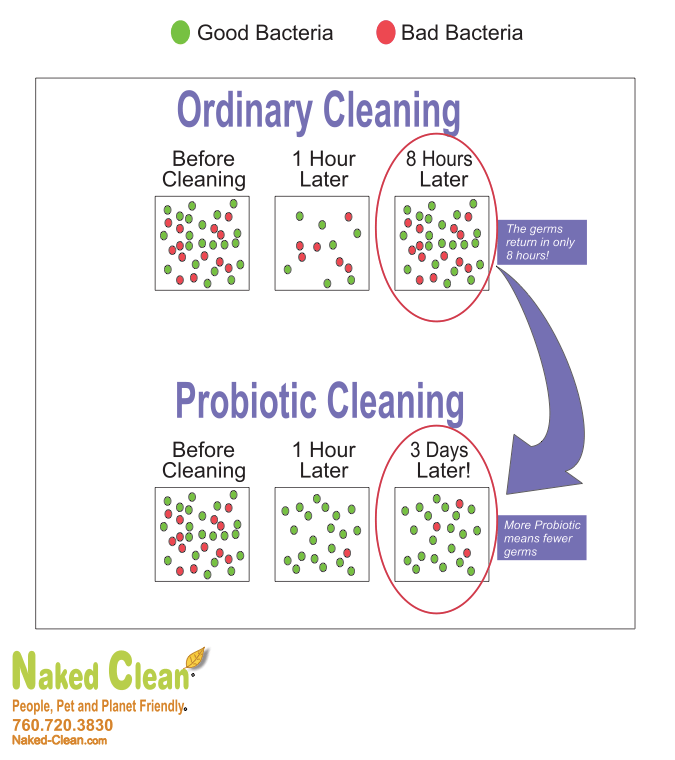 What interested me in this company, Naked Clean, was their use of special probiotic cleaning products instead of harsh chemicals. I have been trying to move away from all antibacterial and bleach-based products in my home. I have been trying to use things like vinegar and baking soda but have still been looking for something better. You can read more about why they use probiotics here. I first heard about Naked Clean on SanDiegoBargainMama.com and thought it sounded pretty cool. I’m normally sensitive to artificial scents, but pregnant I’m even more so. So when the opportunity to review them came up, I jumped. Full disclosure: I received a free demonstration of their house cleaning (2 housekeepers for 1.5 hours) and a sample of Naked Clean’s probiotic cleanser. The opinions expressed are entirely my own, based on their sample cleaning and my own use of their cleaner, primarily in my kitchen. I am also human and any errors or inaccuracies are unintentional and will gladly be corrected. What most impressed me from their sample cleaning was the white kitchen sink and sparkling, spotless stainless faucet, even brighter than when it has been bleached. At first I thought I might be imagining it, but not only did my sink get as bright white as when it has been bleached, but it actually seemed to STAY white for days, even after dumping coffee grounds in the sink. When I told Dave, the in-home estimator at Naked Clean, how the sparkling white kitchen sink impressed me, he explained a little more about how it worked. He said that bleach appears to whiten the sink or tile grout because it actually eats away a thin layer of the enamel or porcelain each time it is used. With time, it makes the sink more porous so that it will actually stain more quickly in the future. Their probiotic cleaner, on the other hand, contains a natural cleanser, or surfactant, as well as the probiotics. The surfactant does basic cleaning and the probiotics work on the layer of microscopic biofilm that can contain harmful bacteria, such as Salmonella, Campylobacter, and E. Coli. What’s more, he explained, the probiotics stay alive for three days. So even after a surface has been cleaned, they continue to protect, without you having to do anything. This immediately piqued my interest. I have always had a phobia of the cooties from raw chicken and, ever since my husband and I suffered Montezuma’s revenge for weeks from campylobacter, I have wanted everything STERILE! The idea behind COMPETITIVE EXCLUSION is that during the cleaning procedure a layer of probiotic bacteria is placed on the treated surface, therefore, immediately occupying the ‘field’, the area treated, with beneficial (good) bacteria. These probiotic bacteria act like allied “solders” that overwhelm the area and that will consume all of the available food sources (including dead organic matter by means of necrotrophy), leaving nothing behind for potential pathogenic invaders requiring space and food. The probiotic bacteria are formulated to be extremely efficient and outdo all other (pathogenic) bacteria. Additional to competitive exclusion, also, most important, QUORUM SENSING between pathogenic bacteria is influenced. This is an extremely fast way of communication between bacteria, making use of signal molecules. When the probiotic bacteria are applied to a surface, this immediately results in the fact that pathogenic bacteria, by means of quorum sensing, are communicated about this unfavorable condition, causing them to go into an inactive metabolic state. I have been a fan of getting a little “help” around the house for years. Even back in the days when I was a graduate student, working for free in this lovely system called “interning,” the little bit of money I could devote to a bimonthly professional cleaning was well worth the time and agony it saved me. Let’s just say that I like a clean and sanitary home more than I like actually cleaning. Once I moved in with Papa Bird, who likes things even neater than me, having regular professional help cleaning the house prevented a lot of fights. Once every two weeks we don’t have to worry about who is going to do the dishes or finish the laundry. A colleague of mine who is a Marriage and Family Therapist once said that paying a housekeeper was money better spent than on couple’s therapy. Scheduling with Naked Clean was pretty simple. I was given a one hour window of when they would arrive. The house cleaners usually work in teams of two. One nice touch I appreciated: I received an email confirmation the day before. Overall, the cleaning they did was thorough and professional and I love that there was no chemical smell from the products. When I used the probiotic cleaner afterwards, I thought it had a light, fresh scent, but apparently it contains no fragrance at all. I used to hate the idea of giving Little Bird a bath in a tub that had been cleaned with bleach and other chemicals and I’m so happy to have found a natural alternative. You would think that green cleaning services would be expensive, especially since all of the products and supplies are provided by them. They advertise prices that are a little more than hiring someone off the street, but less than most cleaning companies, and I find that to be true. For example, they start at $65 for 5 rooms. I’m also happy to extend a special offer to my readers: $40 off your first cleaning when you mention the Baby Bird’s Farm blog! Contact them here. I hope you do and let us know what you think!